Released on Catalyst/BMG (out of print). Produced by Andre Gauthier. Executive Producer: Tim Page. 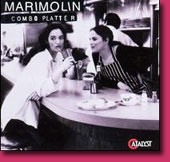 Marimolin's final CD features an eclectic mix of light contemporary classical & pop/world-influenced music including Robert Aldridge's "Combo Platter," Paul Lansky's "Hop," Steve Mackey's "Feels So Baaad," & Joseph Shabalala's "Nansi Imali."